A clean and classic mushroom pleat lamp shade with an eye-catching bell shape. Add new style with this mushroom pleat lamp shade. The shade comes in an antique white color and has a clip-on fitter, making it perfect for use with library lamps, accent table lamps and more. The shade has a polished brass finish clip fitter. 5" across the top x 11" across the bottom x 7 1/2" on the slant x 7" high. Clip-on shade for chandeliers or small accent lamps from the Brentwood collection of lamp shades. Antique white color shade with mushroom pleats. Recommended for use with a 40 watt standard bulb. This was an exact match for a small swing arm table lamp and it was a very good price. I was looking for a spider type, but I can remove the harp and clip this right on the bulb. This size shade was not available in our local stores. The stock was either too big overall or I needed to buy the lamp to get the shade I needed. This size with this classic look is hard to find! Hopefully, this will fit a lamp I already have. Need to replace it's worn out shade. Needed that size but really wanted a choice of colors. Flagged the beige one but it disappeared. Like the style and especially the price. This size seems to be very difficult to find. You had it-I bought it ! This will go very well in my Cape Cod themed guest bedroom! I'm glad to have found this shade because I wasn't able to find it at any of my local stores. This size and style are hard to find in stores. Clip-on shades are also hard to find. Your store had what I needed. Have a vintage lamp shaped like a poodle on a pillow that is missing a shade. Needed a shade 7” tall. Have two bed side lamps that need clip on shades. Difficult to find in stores and found only one style on Amazon. This pleated style was exactly what I was looking for and am so pleased to find it at Lamps Plus. Had the closest measurements to original lamp shade. Needed very small shade for child's lamp. Wish you had them in colors though. I added two LED light bulbs to two of my bed-side table lamps and I needed to get two new lamp shades as a present for my wife. I needed a clip on shade for a small table lamp in guest bedroom. I had a really hard time finding this size. So happy I finally found the shade I need. Needed for an antique floor lamp used for reading by a reclining chair. Other shades don't tilt and adjust to the wrong height when placed under the bulb. Glad I found this! I need the shade that screws on, not the clip on, do you have them? Do you have the lamp shades that screw on? When I look at 2m861 it says free shipping, but when I go to check out it adds $5. What's happening? BEST ANSWER: Hi Judy - This item ships free with orders over $49*. I have an old reading lamp that holds a shade from the top ( the narrowest part). Does such a thing exist today? BEST ANSWER: Hi - it can be a clip-on shade or an uno shade possibly. 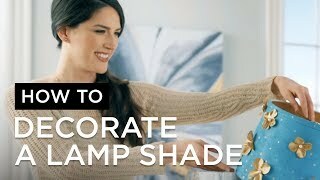 I have added a link below to assist you in narrowing down the type of shade you are needing. Please also feel free to contact one of our knowledgeable Lighting and Home Décor Specialists who can provide you with some fantastic advice and possible options. shade for floor lamp with wide opening for bulb? I purchased this to replace the exact same shade that was on my desktop lamp. I think it might be too small for a floor lamp. The opening is wide enough, but the dimensions may not look right on a floor lamp. I need the shades that screw on at top. Do they screw on at top of shade? BEST ANSWER: This lampshade does not have a screw at the top. It is a clip on shade. It clips onto the light bulb. 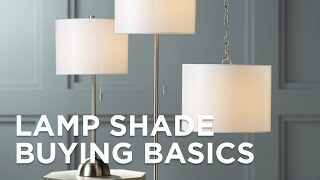 No, the shade has a wire clip that attaches to the top of the light bulb. There is no structure to support a frame with a screw on top. However, the shade is light enough that the wire clip is sufficient to hold it in place. Is this lampshade fabric or cardboard? BEST ANSWER: It is a pleated fabric over a plastic base. You cannot see the plastic part. There is no cardboard whatsoever. It is a very nice lampshade for the price! Thanks for your reply. Have you been able to use a light bulb higher than 40 watts? The lamp that I have this lamp shade on is on the island in my kitchen. This lamp is on 24/7/365. I always use a 60 watt bulb in the lamp, and have never had a problem. Thank you, for your reply. I was hoping to use a higher wattage than 40 , and am please to hear it is safe to use a 60 watt bulb. Thank you, for your helpful reply. The base is plastic covered in fabric. It's working for me very well. This shade is a light fabric shade. I have need of a shade for a floor lamp. 11" across the top and 16" high. Do you have anything close to this? BEST ANSWER: Hi! I'm sorry that we don't have anything in the exact dimensions you provided however I have included three options that may suit your needs. Click on the images below for more details. I looked everywhere and couldn't find a clip-on lamp shade. I was about to buy a different lamp. I love how this shade makes the light bright and white! Great shade for the price! Great shade for the price. I replaced the one on my existing desktop lamp, and it looks awesome! Happily the one that I purchased matched the one on the second lamp. The most important thing is, we cannot tell that it was a replacement for a damaged item. Just what we wanted. Same as the one we are replacing except for color. These are the perfect replacement shades for my antique marble based lamps. Very well made. This lampshade is exactly as described and just as I needed. It looks very nice and is well made and fits over the light bulb perfectly. A good purchase. This lamp fits small accent lamps perfectly. It would be nice to find it in other colors or similar shades in other materials and styles. I found this one after looking for about two months. They sent wrong color. Little patience with a company that cannot handle a simple, one item order. The ad sows this in white and off white. When Eric placed the order he verified he ordered off white since I never use white. A snow white one arrived. I was told it is not available in white but off white is clearly shown. No explanation was provided. Hi Irene K., so sorry to hear that there was a misunderstanding with the item that was ordered for you. This item is in fact a white lamp shade, not an off-white shade. We do sincerely apologize for any inconvenience. We've confirmed with our customer service team that you have been assisted regarding this matter, but if you would like further assistance with ordering a shade that is right for your needs, please reach out to them again via phone, email, or chat. Thank you.